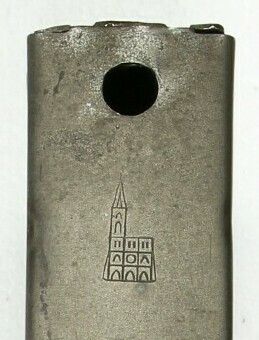 The West German Bundeswehr used a 30 round magazine for their M1 Carbines that has a distinctive logo of a church, upside down and located on the back of the magazine towards the bottom. A number of these magazines were imported into and sold in the U.S.A. Packaging they came with indicated they were manufactured in West Germany but had no other information. 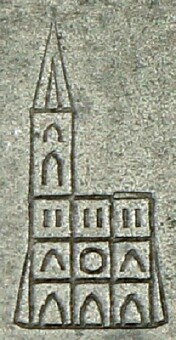 Which West German company used this church logo as their mark? Thanks go to Florian Müller for keeping his eyes open for us. In July 2017 a seller on the German auction website EGun.de listed a box of new old stock cartridge links for caliber 7.62 x 51mm. The listing did not show if the links had markings but on the outside of the box was the same church logo. 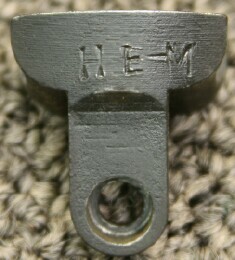 The number 12 within the NATO stock number identifies the item was for use by Germany. 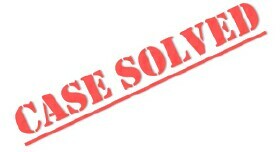 The sequence with WM is believed to be the contract number. 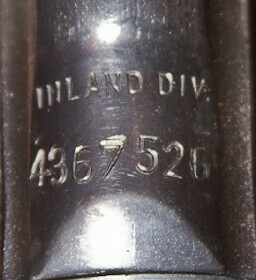 The date of manufacturer is believed to be 1965. The current NATO stock system indicates this part has been replaced. The supply sources still on record are various German military logistics supply agencies. Hein. Hülter Jr. in Iserlohn was a metal factory founded in 1890 (magazine advertisement sold on EBay Germany from unknown German magazine in 1929). Iserlohn is located approximately 90 miles east of Düsseldorf in North Rhine-Westphalia, Germany. Hessen was one of three lands within the American Occupation Zone 1945-1955. 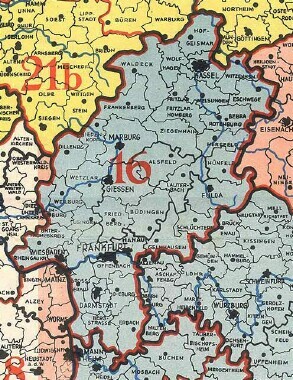 The eastern border of Hessen faced the Russian zone/East Germany. The Hessen border police were established in March 1946. The Mystery: What markings were used by Hessen and what happened to their Carbines? In November 1945 the Allied Control Council for Germany approved the use of certain weapons by the German police. The German police within the American Occupation Zone were subsequently armed with S&W Victory Revolvers and U.S. M1 Carbines. One of the mandates of the Allied Control Council directive was the marking of the weapons used by the German Police. The manner in which they were marked, and where, was decided by OMGUS at the Land level, in this case meaning OMGUS Hessen in Frankfurt. 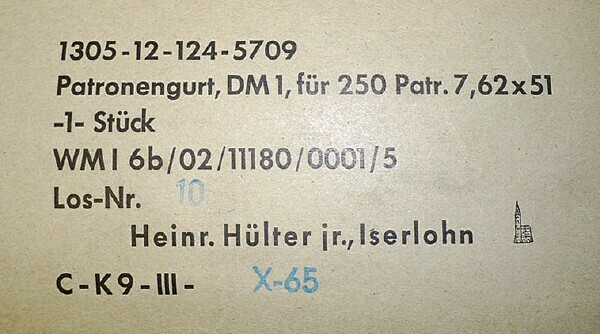 The first edition of the book U.S. Karabiner M1 by Wolfdieter Hufnagl, included a photograph of the markings used by Hessen and indicated Hessen had removed the U.S. markings from their carbines. During communication with Hufnagl he indicated his source for the photograph and information was a police officer in Hessen. Hufnagl had not observed the carbines himself. In 1993 INTRAC of Knoxville, TN imported approx. 7800 M1 Carbines from Austria. Amongst these were carbines Austria purchased from Bavaria in 1955. In 2008 Austria returned approx. 6700 M1 Carbines to the U.S. Army. The army turned the carbines over to the Civilian Marksmanship Program (CMP). Many of the carbines had also been purchased from Bavaria by Austria in 1955. CMP sold the carbines in 2009. Amongst both groups from INTRAC and CMP were a number of carbines that had the U.S. markings altered. In each case the carbine had been used by Bavaria prior to Austria. Carbines used by one Land within the American Occupation Zone of Germany sometimes made their way to one of the other Lands (i.e. Wurttemberg-Baden to Bavaria and visa versa). It's not known if Bavaria acquired these carbines from Hessen. Removal of U.S. markings is not known to have occurred in Bavaria. Since the carbines in Bavaria were handled by the Germans on a local level by each agency within that locale as opposed to a statewide level for all carbines, the fact the Bavaria agency names on these carbines varied would indicate it wasn't Bavaria that removed them. Austria did not remove U.S. markings. As can be seen in the photographs below, removal of the GI markings was inconsistent, suggesting the order on which markings to be removed may not have been specific and/or clear. 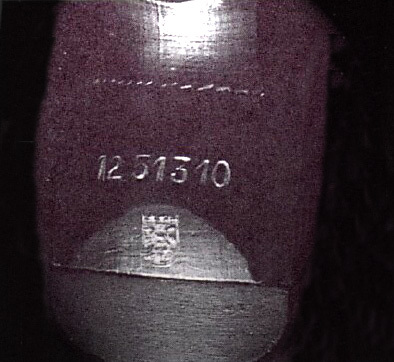 The recoil plate on one of the carbines examined by an armorer at CMP had the markings HE-M stamped into the top. Unfortunately this recoil plate had been separated from the carbine it had been on. Another recoil plate obtained as a spare part by an owner from a source outside of CMP was found to have the markings HE-R. S&W Victory revolvers used by Hessen have the HE-M or HE-R stamped onto the backstrap. The carbines from Austria/Bavaria that have been examined and had markings removed, the recoil plates did not have these markings. 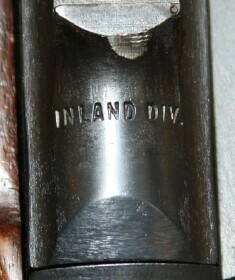 However, on many the receiver bevel had been machined to remove non U.S. markings there. 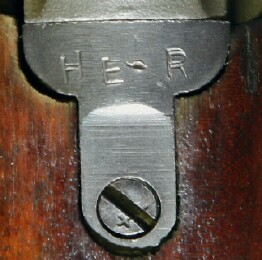 HE-R and HE-M are similar to the markings used by Bavaria and Wurttemberg-Baden during the American Occupation. 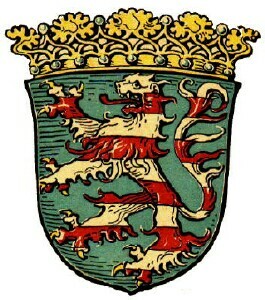 WB was used for Wurttemberg-Baden. Bavaria was used for Bavaria, with the Landpolizei refereed to by Americans as the Rural Police and the city police being refereed to as the Municipal Police, thus the markings HE-R would be consistent with the Hessen Rural Police and HE-M would be consistent with the Hessen Municipal Police. The fact the letters represented police agency names in English instead of German was also consistent in the American Occupation Zone. 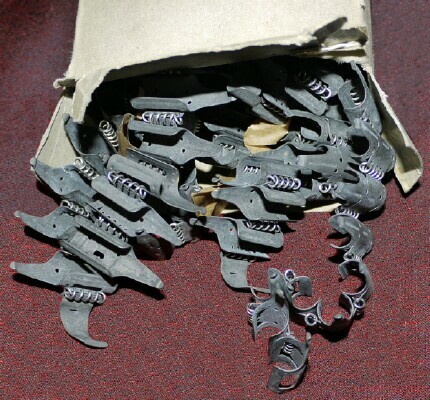 The problem is neither recoil plate was attached to the carbine it had been on and no carbine with either marking on the recoil plate has yet to be found to be examined for the rest of what may or may not have been used by Hessen. 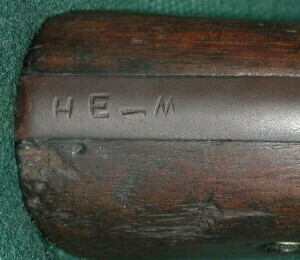 If you know of someone or you yourself have a U.S. Carbine with either HE-M, HE-R, or Hessen crest, please contact me. The basic outlines of the British and American zones of occupation had been agreed upon at the Quebec Conference in August 1943. This agreement left the American zone land-locked. During later negotiations the British conceded the ports of Bremen, Bremerhaven, and the staging areas in the immediate vicinity to the Americans [Leahy, Fleet Admiral William D., I Was There (New York, 1950), p. 263]. 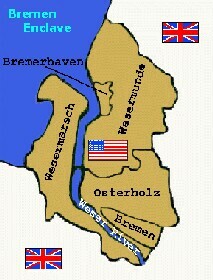 It was this decision which resulted in the Bremen Enclave becoming part of the American Occupation Zone. The territories of the Enclave were handed over to the Americans by the Canadians on 23 May 1945. The Bremen Enclave was about 1500 square miles, roughly the size of Rhode Island. The population was 486,000 in December 1946. Bremerhaven sits at the entrance to the Waser River at the Atlantic Ocean. Bremen is approximately 40 miles down the Waser river from Bremerhaven. The ports of both cities, and a number of smaller towns in between, became the entry/exit port of all U.S. military personnel and supplies for U.S. Forces in Europe. Bremen was normally used for supplies destined for the Germans in the American Occupation Zone, including Lend-Lease materials. Bremerhaven was normally used for U.S. military supplies and the movement of U.S. military personnel. The Mystery: What markings were assigned to the German Police in the Bremen Enclave and what happened to their Carbines? No information whatsoever has been found for this question. If you have any information please contact me. When construction of the Berlin Wall started in August 1961, American forces began distributing weapons. Horst von Domarus is a retired Berlin police officer who served with BEPO as an armorer. He recalls the weapons were received in September 1961 and all weapons were marked with the West Berlin Police star on the rear sight platform just forward of the carbine's rear sight by him and other armorers. The Berlin Police star has often been referred to as the Berlin sunburst or Berlin flower, based on it's appearance. The Berlin star appears on the Berlin Police belt buckle, helmet insignia, and shoulder patches. The outer star on the buckle was stamped on the weapons used by the police in West Berlin. 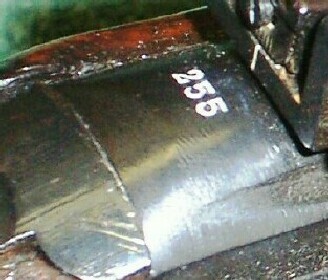 To the right is an example of the marking on a Walther P1 pistol. The Mystery: Where did the U.S. Carbines used by West Berlin go? In late 1966 or early 1967 Horst von Domarus and others assigned to BEPO cleaned the American weapons and drove them to Andrews Barracks, where they returned all of them to the U.S. Army, while other German police units in West Berlin did likewise. When the carbines and other weapons were returned to the U.S. Army, the Berlin star was still on them. 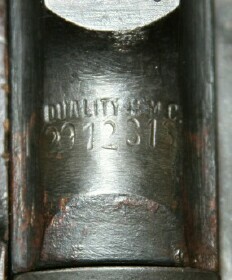 If you have seen, own, or know of a U.S. Carbine with this marking, please contact me.